Quilts - many layered bedcovers with decorative designs made at home or in professional workshops - are at once chronicles, shared experiences, comforters and crucibles of thoughts and emotions. To make a quilt requires immense discipline in order to bring the whole ensemble into being as intended. 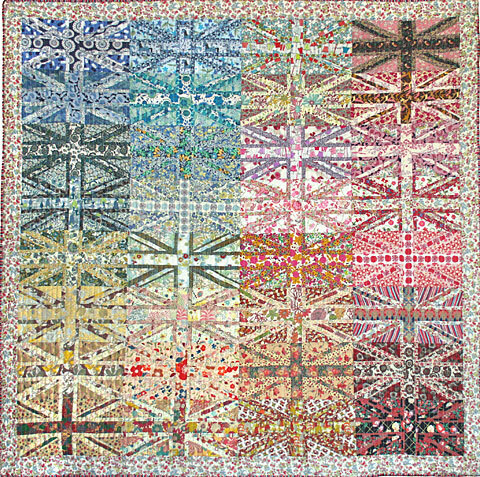 Some quilts are loud, packed with imagery; others are mono-coloured, quiet and tactile. The Victoria & Albert Museum in London presents the first major exhibition about their art - "Quilts 1700-2010" is a comprehensive repository of memories. Quilts in the eighteenth century used ornamental patchwork or fashionable textiles like colourful chintze and silk velvet. They often celebrated the birth of a child, and were usually handed down through families. 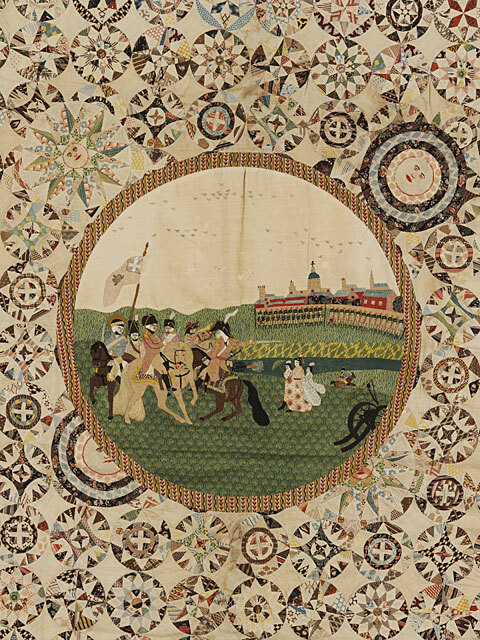 Quilts' rich span of history is full of narrative. Stories build, patch by patch, and the many examples of collaborative activity are side-by-side with quilts made by a noble woman. Cheap, machine-made printed cotton flooded by the market in the nineteenth century when fragments and ready-cut patches began to be offered by tailors. Military victories, patriotic occasions such as George III reviewing the troops in 1803 and coronations began to be celebrated, and observations made about the world. 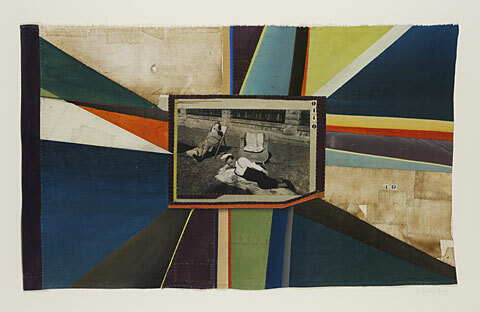 Story telling in an age before television made the quilt a vivid medium for maker and observer. Making patchwork became a popular aspirational hobby, and, as a way of individualising the home, it spreads like wildfire among both middle and working class women. There are also plenty of poignant stories like quilts created by prisoners, with individual stories depicted in each patch. 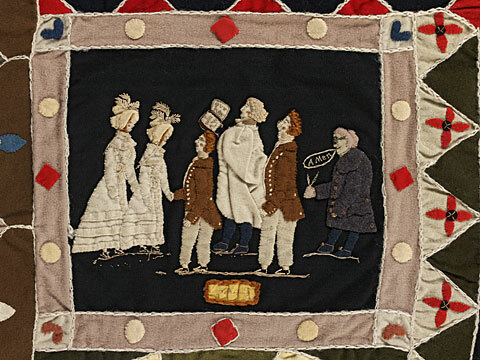 Consider the plight of soldiers forced under duress by their officers in charge to sew military quilts, as an alternative to the perils of drinking and gambling. 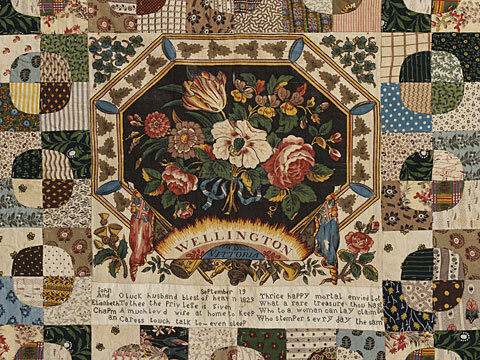 The Rajah quilt on display, loaned by the National Gallery of Australia, was made in 1841 by women convicts aboard the carrier HMS Rajah as they were being transported to Tasmania. And the quilt made out of blank squares to commemorate soldiers killed in the Iraq war. 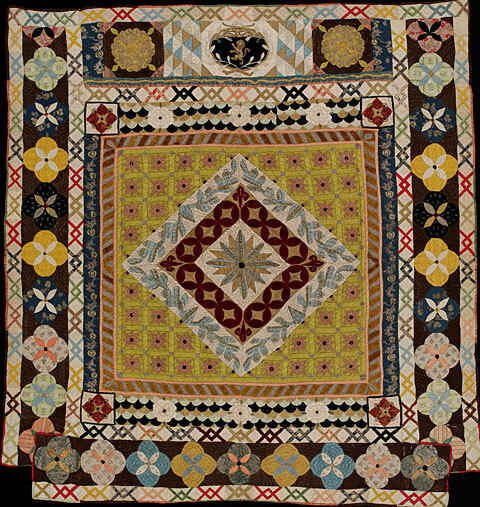 From the twentieth century, quilting was overtaken by industry remained a vital craft activity incorporating inventive techniques. In the hands of contemporary textile artists quilts today still represent personal and collective dreams, but tasks changed. What story to tell? How to update symbolic layers? How to rearrange craft-techniques? 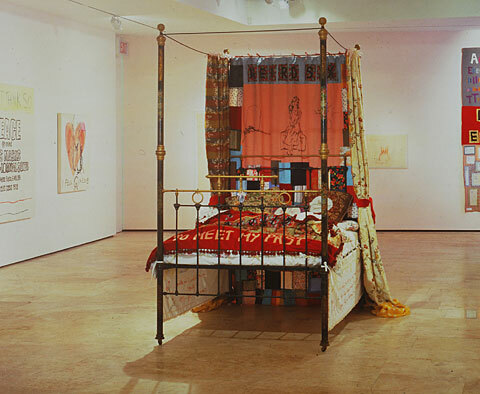 Quilts like "Right to Life" by Grayson Perry with a pattern of multiplied fetuses, the displacement-flag "At the End of the Day" by Natasha Kerr or the installation "To Meet My Past" by Tracey Emin give an idea of the spread. Much more quiet come "Box" by Diana Harrison. She collected thrown-away cardboard-boxes in the streets and asked herself, how to transform them into a quilt. 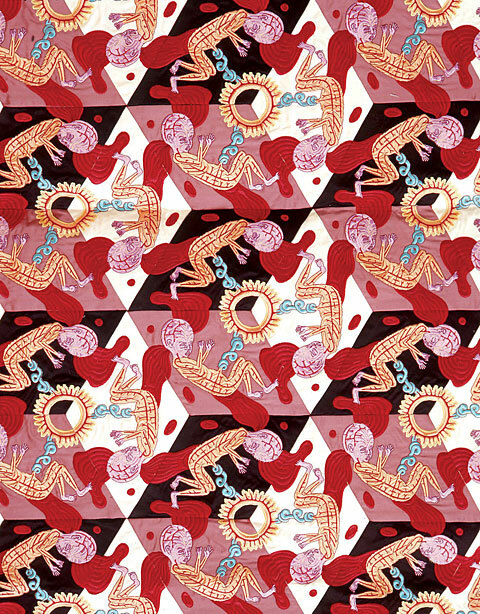 The unfolded box-cut defines the quilt's form. The wave-structures are reflected in the pattern. The silk-surface supports a shadow-play which reminds subtly to battered cardboard. Of the sixty-five quilts on display, the V&A Museum has put on show a lot of quilts it owns, but has also borrowed its examples from the artists, with other historic examples coming from UK museums including the Geffrye Museum, Ulster Folk and Transport Museum and Glasgow Museum. The exhibition conveys very well that for three centuries they have been maps of human lives, a unique method and "lens" for seeing the world, prising open beliefs and ideals. 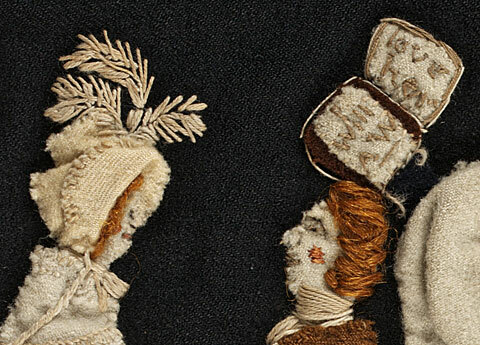 They can also be literal map samplers registering passions for embroidery and cartography. Symposium "Quilts 1700-2010: Hidden Histories, Untold Stories"